Well, it’s that time of year. Full of Holiday parties and Holiday Cheer. We have some wicked talented best friends who do shows all year long all over the country. You probably have a few gifts left to procure. 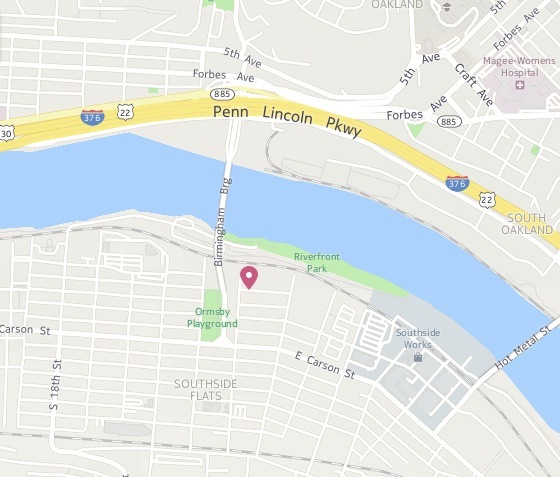 So why not have fun and find something special in a super chill, low-key fun environment in Pittsburgh and pick up some handmade, crafted right here in not only the USA, but in Pittsburgh by local and crazy talented artists. Have some fun, drink a craft brew beer, and bring your friends and family. “The last minute Christmas market is sponsored by a few local artists. Come shop for some crafts, hang w friends. drink some beer. family friendly. Where: At the CommonWealth Press Warehouse (not retail shop!) located at 2315 Wharton St‎. Pittsburgh, PA 15203 on the South Side. When: Saturday December 14th, from 2pm – 6pm (ish) and ONLY! Why: Because Friends are neato and Handmade is best. You probably think of lots of things when you hear the name “Flint, Michigan” right? Rock’n’Roll and an amazing past & contemporary poster show should now be among them. Flintstock is a new music and poster show happening in Flint, MI at the Flint Institute of the Arts (FIA) on Saturday September 26, 2009 and you should totally GO check it out. Flintstock comprises of 7 legendary bands and TWO poster art shows, so it’s kind of a blowout. In fact, Paste Magazine wrote a nice little piece about the show here! I will have 10 posters in the “Graphic Beauty: Contemporary Rock and Roll Posters” show during Flintstock, as well as posters by a rad array of contemporary working poster artists from around the US, and there is also a super retrospective on display called “Flashback: Posters from the Golden Age of Rock and Roll”, all on view at the Flint Institute of the Arts. 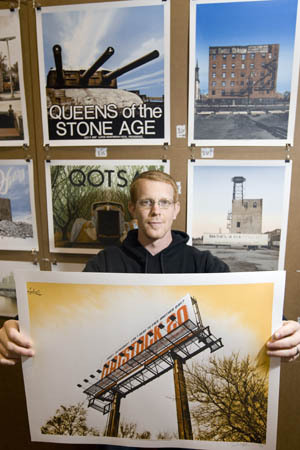 And, to make things even crazier, Mike Budai will be on hand in person at Flintstock to sell and chat posters. Yes way! The 2 concurrent poster shows will be up for viewing from September 26th through November 8th. Ten hours of Art, Love and Rock & Roll: from NOON to 10 p.m. Saturday September 26, 2009. Located on the FIA grounds. The FIA will host a celebration of Rock and Roll, featuring 7 live, legendary bands throughout the day. Meet contemporary poster artists featured in the exhibition, who will have their original artworks available for purchase. Enjoy food and refreshments from one of our many food vendors or our beer tent. Shop the wares of local handmade artists and visit the museum shop for authentic Rock and Roll memorabilia. Admission for this event is $5 per person. Morseville Bridge For more information visit the FIA website or the Flintstock MySpace site. Heeeeyyyy! It’s tour season, not just for bands but for poster artists too. And that means a new Flatstock Poster show! 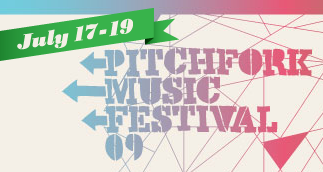 This next Flatstock is at Pitchfork Music Festival in Chicago, IL inside Union Park. Flatstock is a series of rock poster shows & conventions that happen currently 4 times a year in Austin, TX (during SXSW), Chicago, IL (during Pitchfork Music Festival), Seattle, WA (during Bumbershoot Music Festival) and Hamburg, Germany (during the Reeperbahn Festival). The Flatstock shows provide the public with opportunities to see fine poster art in person and to meet the artists who’ve created it, while showcasing the breadth of individual styles they represent. Since beginning in 2003, Flatstock has presented 20 events in the U.S. and Europe and has become the epicenter of the current phenomenon in handmade poster art. Myself and over 40 other national poster artists will be there at Flatstock selling prints, posters and more and talking with thousands of music and art fans. Come see us, say hi, and chat. We’re mostly super nice, and definitely geeky about art. 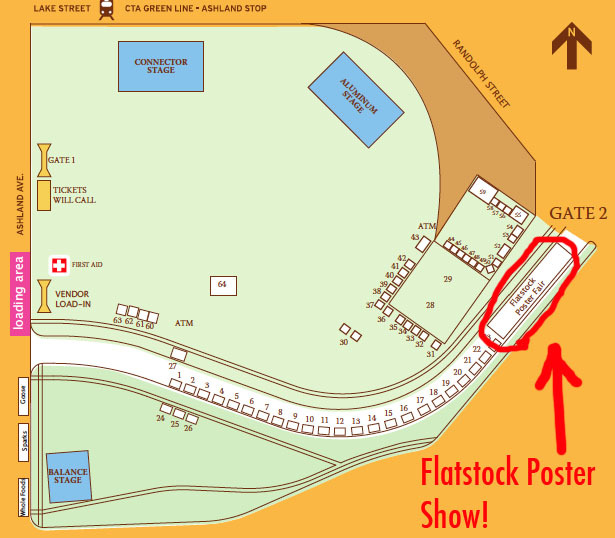 And, check out the map of Union Park, Pitchfork’s stages and Flatstock’s location in Union Park. Meet your 2009 Flatstock Chicago exhibitors! The below is the official FS 21 lineup. Man, whew! I’m beyond tired. We had such a great time at this year’s SXSW Music Festival and Flatstock Poster Convention in good ol’ Austin, Texas. Lots and lots to tell, but overall the show was really successful. I feel like we all got to talk to a lot of new folks, see some happily familiar faces and once again get people jazzed about posters and music and the art in between them. Such a great feeling. 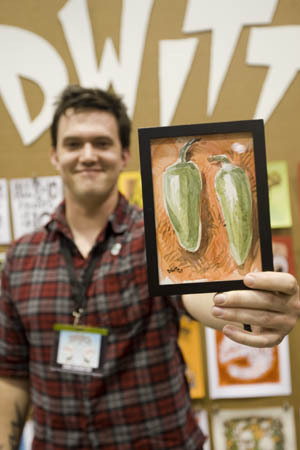 Especially since the Flatstock show was 4 days long this year, up from the former 3-day event. 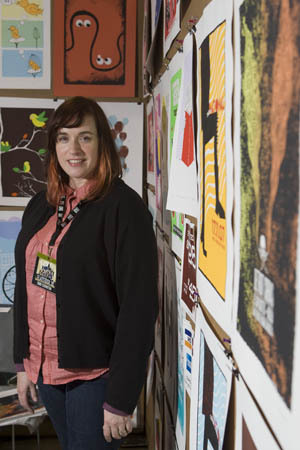 The Austin Chronicle’s Audra Schroeder wrote up a very nice piece about Flatstock and it’s tradition with SXSW here with some super photographs accompanying the article by Mary Sledd, above and below. Me, strawberryluna, doin' my thing. Photo by Mary Sledd. Dave Witt, being awesome. Photo by Mary Sledd. Flatstock is a really crazy mix of super hard work and high-energy talking, particularly the SXSW version and then…so much fun. We bunked up with our best pals from Hero Design Studio, as per usual, and the laughs seriously never stop. Just when you think it’s bedtime and you can’t take any more? BOOM. The North American Free Trade Agreement becomes the funniest thing to happen all week. We loved Austin so much that we made a very special stop at Cavender’s Boot City in Austin (with the world’s loudest women’s rest room EVER) on the way to taking our good friends, the Doublenauts to the airport on our last full day in town. Check out the boots that I could not pass up. Takin' a little bit of Texas home with me.